Browse our large collection of recipes or submit your favorites to share. You can submit your favorite recipes to share with RecipeTips.com users, or keep them private for your own use. Manage your favorite recipes in a free, private Recipe Box and organize your recipes in categorized cookbooks. 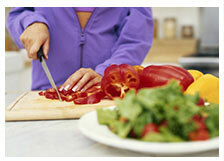 Or make meal planning easier by creating your own weekly meal plans and menus. Which you can print the recipes and grocery list all at once!